It’s that time of year, the time of year when all the holiday magazines and catalogs come out featuring stunning gingerbread houses, gingerbread castles, gingerbread churches, and even a gingerbread Tardis. I am by no means a gingerbread expert. I have never had a gingerbread creation featured in a magazine. I do however, every year, create gingerbread houses with approximately 20 children of all ages, all working at the same time. 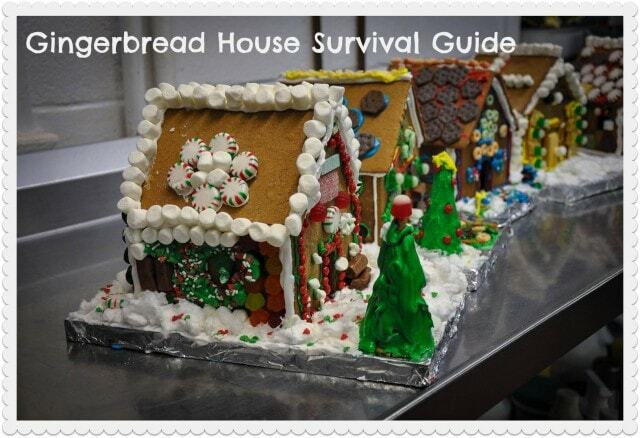 Allow me to share gingerbread house survival tips I learned along the way. 1. Know your skill level and goal. Is your goal really to re-create a gingerbread Black Pearl, complete with frosting whirlpool? Or, as is often the case, is your goal merely to play with some frosting, decorate with candy, make it through ten minutes of “oooh, it’s so pretty,” and promptly devour the treat? What ages are you working with? What sort of manual dexterity and patience do your kids have? For the younger set, the tried and true method practiced by kindergarten teachers all over the U.S. – graham crackers over milk cartons with store bought frosting. Get yourself a jar of frosting, a package of graham crackers, and a couple of pints of milk. And candy of course, lots of candy. The process is simple, pretty much like laying tile. Slather the back of a cracker with frosting and slap it on the carton. Easy peasy, little to no dry time, and immediately edible. Personally, I don’t believe gingerbread houses are a one day project. I view them as a three day project. Now, don’t panic. There’s really only a few hours of work total. Day 1: research and development. We like the public library for this one. We check out a dozen or so books on gingerbread houses and spend the day leafing through them and marking pictures we like. Then, the kids make a pattern on cardboard. You MUST make a pattern. 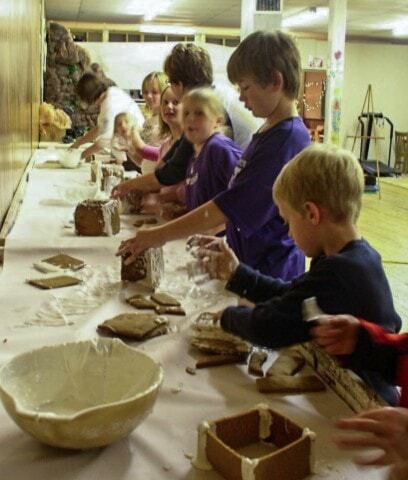 Once you have passed the milk carton stage and are on to actual gingerbread construction, winging it is not an option. We prefer to make our patterns out of cardboard, it’s sturdier and easier to cut dough around than plain paper. Make a pattern for every single piece of your house. If you’re going to cut it out of gingerbread, cut it out of cardboard. Next, dry fit the pattern together. This is your chance to make sure everything fits together. Does the roof match up with the walls, do the shutters look right? Dry fitting your pattern- especially with older kids that have grand creations in mind- will save you a lot of heartache and gingerbread repairs later on. 3. Build what you love. In our house, we are all about the dogs. There is a dog with us 24/7. So, we build gingerbread dog houses. If your kid LOVES monster trucks, build a ginger truck. Heck, do the ginger milk carton and stick spiderman to the side. If kids build what they love, they’ll be happier with the results. 4. There’s more than one way to bake gingerbread. Now granted, I bake something like 40 batches of gingerbread at once. And it’s possible that there may have been some eggnog involved. Sometimes the nutmeg made it in, and sometimes it didn’t. Know what? No one noticed. You’re not baking cookies, you’re baking something that’s going to be slathered in frosting and candies. What you’re striving for is a gingerbread that is solid, and will hold up to construction. My favorite gingerbread recipes come from Ultimate Gingerbread. 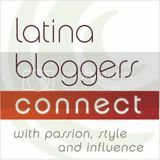 They have recipes, patterns, suggestions, and advice to fix whatever mistake you make. 5. Make two types of frosting with these Gingerbread House Icing Recipes. 1) Mortar Recipe: 1 pound of confectionery sugar, 1/4 teaspoon cream of tartar, 3 egg whites, beat slowly until stiff peaks form. 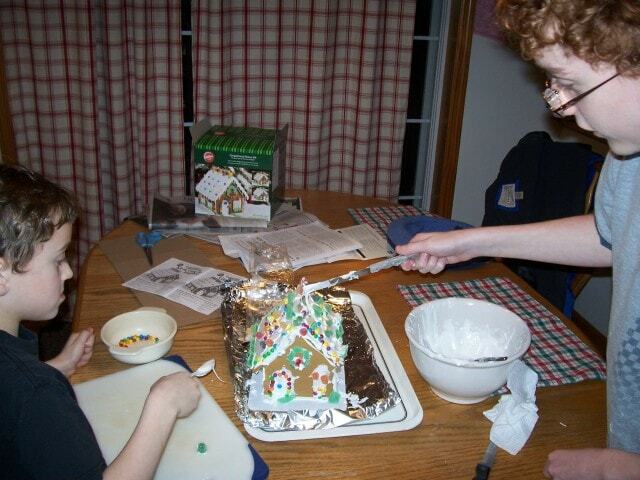 Then we make a basic milk and powdered sugar frosting for the exterior and decorations. It tastes better, and we like to snack on our houses. The recipe I learned from my mother who learned it from her mother. 2) Tasty Recipe: 2 C. Confectioners sugar, 2 T. Milk, 1 t. vanilla, whip together. This frosting is also very easy to color and add other flavorings. 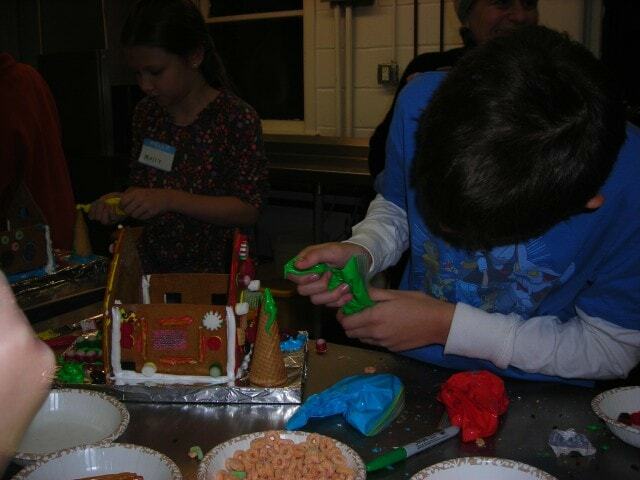 You’ll notice in all three of the photos, the kids are handling frosting a little differently. If you have pastry bags, use them. Plastic bags with the corners cut off work great too. My kiddos prefer knives in a big bowl of frosting. 6. Remember the Leaning Tower of Pisa is famous for its flaws. Okay, so you’re going to make a mess. A big mess. Your neighbors and their kids are going to make a mess. Why not just make one big mess instead of several small ones? Plus, there’s lots of hands to clean up. For each adult present, take 1 oz vanilla vodka, 2 oz Kahlua, and ½ oz gingerbread liqueur (found in the coffee isle.) Pour over ice, shake well. Pour into a glass and garnish with freshly ground cinnamon. So, draw up some plans, fire up the stove, and get baking! Can You Name All the Things That Will Drop This New Year’s Eve?